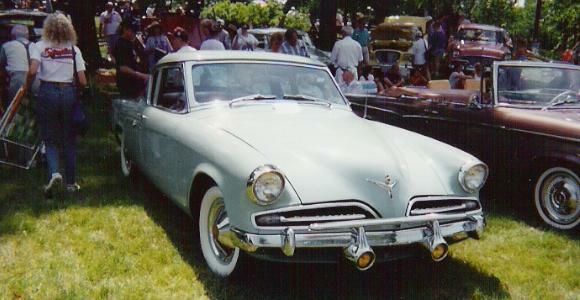 This sharp 1953 Studebaker Commander Starlight Coupe belongs to Dave Bond of Leesburg, Virginia. It can be identified as a Commander by the "8" emblem on the front hood and rear quarter panels. The 1953 Studebaker "Lowboy" was designed by Bob Bourke of Raymond Loewy Associates. With its long hood and low roofline the Starlight Coupe and similiar Starliner hardtop were quite radical for the time. 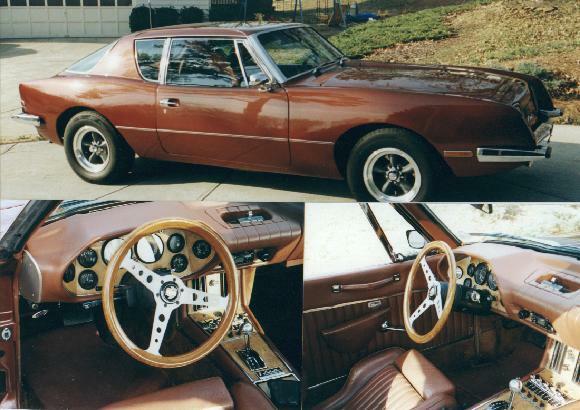 Commanders were powered by a 232 cubic inch V8 rated at 120 horsepower. 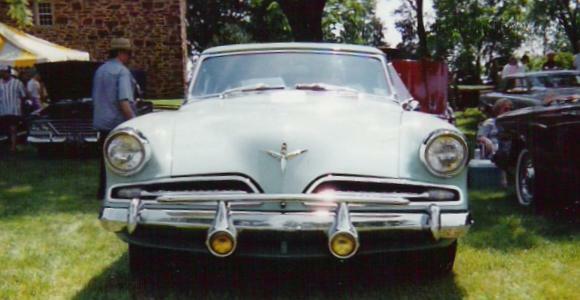 The 1953 model had a reputation for weak brakes. This was fixed for the 1954 model year. The fog lights and front bumper bar on Dave's car are optional equipment. These pictures were taken at a car show at historic Sully Plantation in Fairfax County, Virginia. Peter Mansolillo of Suwanee, Georgia sent in this collage of his 1983 Avanti Coupe. 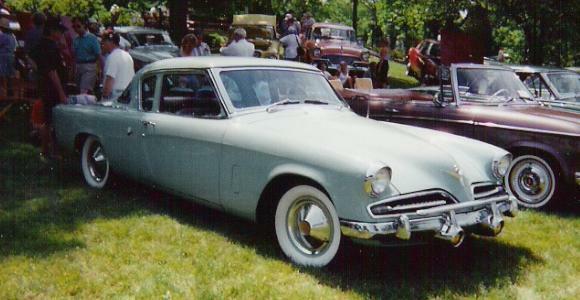 When Studebaker ended automobile production in South Bend, the rights to the Avanti were sold to Leo Newman and Nate Altman. Production was resumed in 1965 in a section of the old Studebaker plant. The Avanti II could be ordered in any automotive color that the owner desired. Several versions of Chevrolet V8 engines were used in the Avanti II. Otherwise, little was changed from the original Studebaker Avanti. After Nate Altman's death in 1976, the Avanti Motor Company changed hands several times. Owners included Steve Blake and Michael Kelly, both of whom tried to keep the enterprise going. Some years were better than others, but production generally stayed under 200 per year. The "II" designation was dropped after 1982. Peter's car is a late chrome bumper version. This 1937 Studebaker Dictator Coupe belongs to Barton and Christine Graff. A 440 cubic inch MOPAR engine lurks under the hood. Otherwise, the car appears to be mostly stock. One has to wonder if "Dictator" was a wise choice for a model of car in 1937 given the rise of Hitler and Mussolini. Studebaker must have figured this out, because 1937 was the last year for the Dictator model. 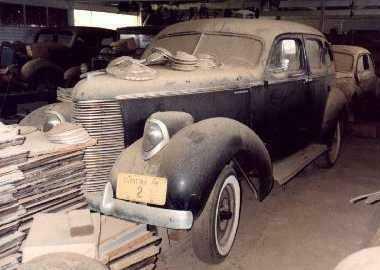 Jason Vogel of Rio de Janeiro sent in this photo of a 1938 Studebaker Commander that is languishing in a barn in Brazil. This Commander has the desirable high style headlights that mimic the nose of the Loewy designed experimental S1 steam locomotive. Commanders were also available with conventional pod headlights. Thanks to Jason for his continuing contributions to this page. Solido of France has produced several 1:43 scale versions of the 1957 Studebaker Silver Hawk in both coupe and hardtop form. Silver Hawk hardtops were not available in the U.S. but were sold in Canada and export markets. This particular example is from a limited edition of 3,000. To see more toy Studes, visit my Studebaker Toys Home Page.